A. S. Colyar, waiting upon the grand jury’s summons as a witness, Thursday morning at the court house, was arrested by deputies from the sheriff’s office, adjoining the grand jury room. The deputies exhibited a warrant from Knoxville, Tenn., charging forgery alleged to have been committed several years ago. No requisition accompanied the warrant. 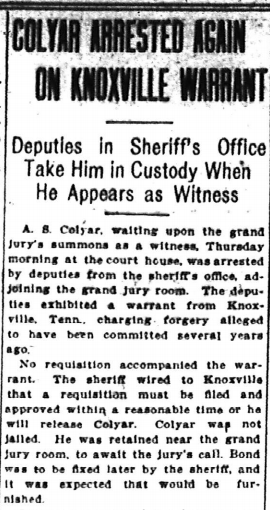 The sheriff wired to Knoxville that a requisition must be filed and approved within a reasonable time or he will release Colyar. Colyar was not jailed. He was retained near the grand jury room, to await the jury’s call. Bond was to be fixed later by the sheriff, and it was expected that would be furnished. Colyar was arrested not long ago by the city police upon what is said to have been and appears to have been this same charge now embodied in a warrant, the arrest being made then in response to a telegram from the Knoxville police. He was released without bond when the formal legal procedure was not compiled with in a reasonable time. Acting as his own attorney Colyar took out a writ of habeas corpus before Judge Pendleton, of the superior court, just before 1 o’clock, and Judge Pendleton set 11 o’clock Saturday as the time of the hearing upon it. Some question was raised informally among lawyers and officials at the court house, as to whether Colyar, being under summons to appear before the grand jury, can be extradited from the state—if requisition papers are forwarded from Tennessee for him. Judge Pendleton declined to fix a bond for Colyar, when petitioned so to do by Attorney W. M. Smith. The judge held that he was without that authority in this case. It is a matter for the sheriff, said he. Mr. Smith applied then to the sheriff for bond.